The Caped Crusader and the Boy Wonder had many adventures in their early years with DC Comics. But in the year 1940 they were only featured in the Batman and Detective Comics publications. Unlike today, when ‘Batman’ first began, it was a seasonal comic book. Instead of a dozen comics a year, only four published in our current timeline. In early 1940, we see the return of both the Joker and Catwoman and the debut of the forever changing Clayface. Story: Batman and Robin fight against the Green Dragon Tong once the mayor of Chinatown is mysteriously murdered. 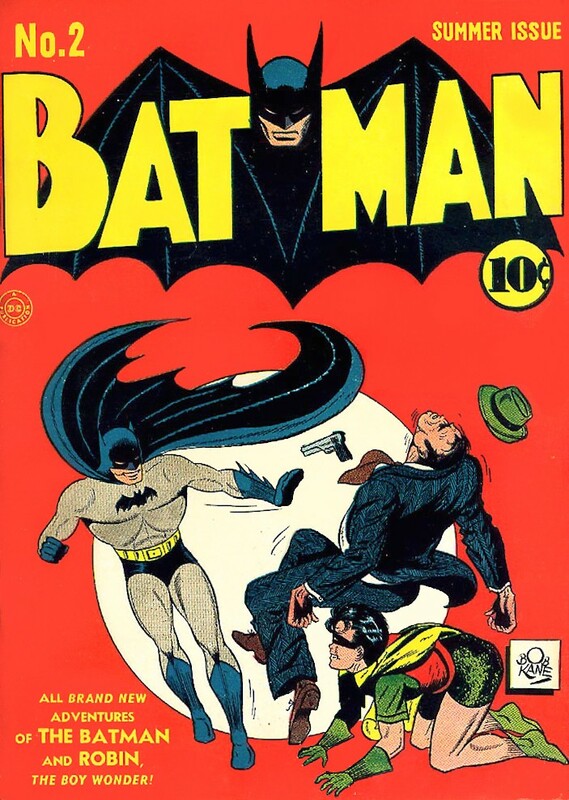 Cover to Batman (Vol 1) 2 from Summer/June of 1940, illustrated by Bob Kane and Jerry Robinson. While the inside stories showcase Batman and Robin up against villains such as the Joker, many of the cover art represented the Dynamic Duo in perfect unison bringing justice to their Metropolis. Story: The Joker is kidnapped by the Crime Syndicate, Inc and barely escapes. Catwoman makes her second appearance and plots to steal jewels the Clown Prince of Crime has his eyes on, with both fighting the Dynamic Duo, the Joker left in a burning building and Catwoman ‘escaping’ the Batplane from Batman’s clutches. Story: Batman and Robin solve the nightly crimes of a master criminal named Wolf, whose first personality is of museum curator Adam Lamb. Story: Batman alongside Commissioner James Gordon follows a trail of murders in Gotham by a man named Ward who is framing Clubfoot Beggs. Story: When Professor Drake brings a 15 foot white caveman by the name of Goliath from Africa to the United States, planning on making him civil, Batman and Robin have to stop Goliath from terrorizing Gotham and Drake’s devious motives to make a profit off his capture. Story: Bruce Wayne fears for his fiancée Julie Madison’s life when leading actress Lorna Dane is murdered on set of the movie ‘Dread Castle’. Batman investigates on the set to track down the murderer, discovering it is an ex actor named Basil Karlo, disguised as ‘Clayface’. 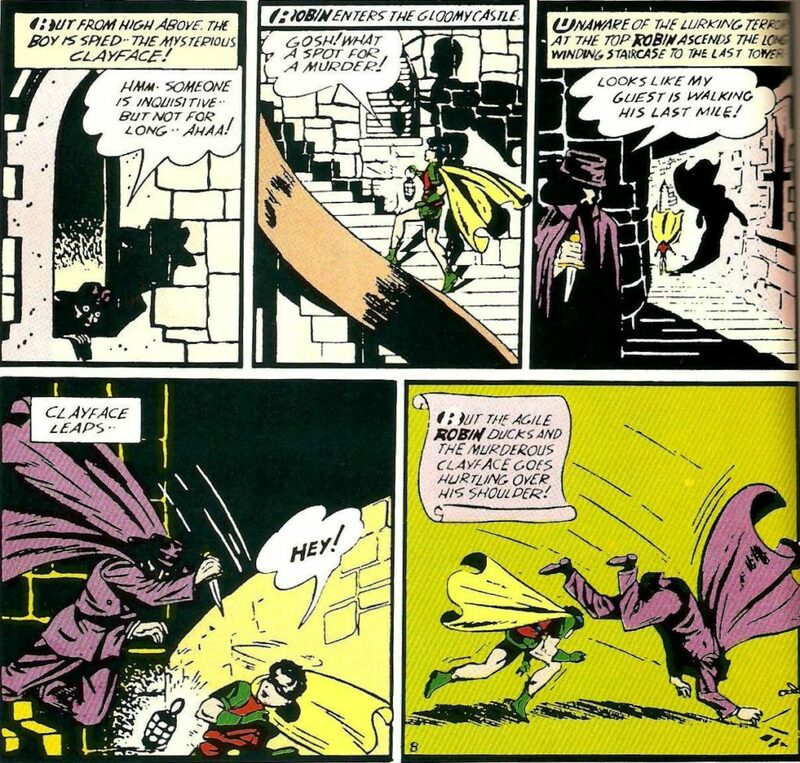 Panels of the first Clayface (Basil Karlo) in Detective Comics (Vol 1) 40, illustrated by Bob Kane and Jerry Robinson. Bat Facts: Although on the cover of issue 40 the Joker makes an appearance, he is nowhere in this Batman adventure. However, this marks the debut of the Batman rogue Clayface and the character of Basil Karlo, who only has one other golden age appearance. We will take a look at Batman’s history in 1940 in our next session, with our first introduction to Gotham City! This week’s Batman issues can be found in the (now out of print) Batman Chronicles, Vol. 2! I don’t think I can get enough of that cover with Batman (sort of smiling?!) shoving a criminal over a sneaky Robin. So good. Also, would spend obscene amounts of money on a modern revision of “The Case of the Missing Link” in which Professor Drake was just Drake (the rapper), and otherwise the plot was exactly the same. Great stuff as always, looking forward the next installment!